We are The Junction Optometrists (eye doctors), located in West Toronto on Dundas Street, 1½ blocks west of Keele and only a few minutes by car from surrounding Pelham Park, High Park North, West Bend, Runnymede and Bloordale Village. Ours is a full scope friendly optometric practice. We perform comprehensive eye examinations with specialty digital equipment, have a complete eyeglass dispensary, fit contact lenses, perform eye exercise therapy (vision training) and arrange for specialty referrals as required. We are certified in the treatment and management of eye disease. We regularly provide eye health and vision services to patients as young as six months of age. Our patients are encouraged to bring their children for their first eye exam by age 3 years. Early detection of underlying vision and eye health abnormalities is essential, to avoid permanent vision loss. We have examined more than 30,000 patients since being in practice here for over 30 years. We are proud of the quality and scope of primary eye care services provided in our office. …to provide quality eye care in a courteous and prompt fashion. Your visual welfare is of prime importance to us. We encourage you to discuss your specific visual needs and concerns, so that we may provide you with the high level of quality vision care that you deserve. 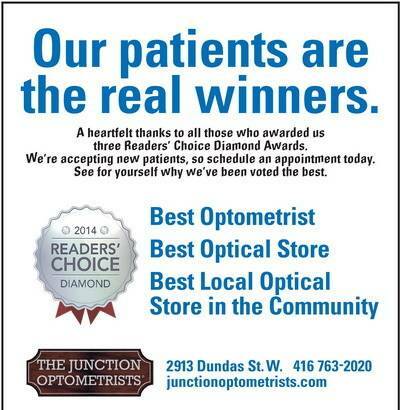 Learn more about Junction Optometrist's special offers. Rebates and Promotions for different brands of frames and lenses.